Inform the citizens of New York? Help people understand their world? Make a mark on society? Craft beautiful online projects and visualizations? WNYC is growing our Data News Team to make high-impact visualizations and projects, and to help WNYC reporters and producers present the facts, expose corruption and explain our world. We've been pioneers in the field of crowdsourcing, data journalism and mapping -- even winning some prestigious awards for our work. Now we're kicking it up a notch. Like to join us? Head over to our official aplication for Interaction Designer and tell us all about you. We did something a little creative and unique at WNYC this past election night: We mapped the vote by "community type." This revealed the diversity of the vote across New York State -- from the cities to the suburbs, boom towns and "service worker" centers -- in real time, on the air and on the WNYC home page. And the diversity is striking. Despite Democratic wins in every statewide race, the Republicans running for state attorney general and comptroller "won" every community type outside "Industrial Metropolis" and "Campus & Careers" counties. Patchwork Nation's Dante Chinni talked about this on air during WNYC's coverage election night, and has written more about it since. The live map was a mashup of Patchwork Nation's unique take on the nation and the Associated Press's live vote totals. At the request of WNYC, Patchwork Nation programmers dove into the AP test results and quickly wove them into a new map based on PN's existing county maps -- customizing them for the event and adding real-time percentages by community type. In the months before the election, I had wondered how we might better understand the early returns -- those that come in typically between 9 p.m. and 10:30 p.m. -- which often don't match the final results. I wanted more clarity. At a Hacks/Hackers Open-Source-a-Thon, I started playing with the election data with help from Al Shaw (then at TalkingPointsMemo, now at ProPublica) and Chrys Wu (of Hacks/Hackers and ONA fame). That evolved into a little program I wrote in Sinatra that generated vote-total map at the left, shading counties darker as more of their precincts reported. It also helped me better understand how the data were structured, how to retrieve the numbers and what it might take to make a live map. So when Chinni asked if WNYC had any county-level data sets we'd like to put through the Patchwork Nation treatment, I had the perfect candidate. New York switches to a new paper tomorrow -- Primary Day -- and ballot designers say voters likely will be confused. At WNYC, we're covering this story in several ways that go beyond audio and written text. For one, we had ballot designers help us annotate a ballot using DocumentCloud. For two, we're welcoming voters to share their experiences with the ballot via text. They (or you!) sign up by texting BALLOT to 30644. My presentation before a room full of talented programmers next week Thursday will include hair salons, semi-trailer trucks and sidewalk chalk. 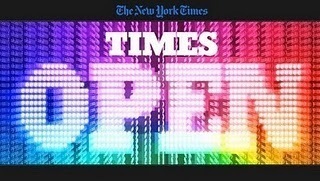 It's TimesOpen 2.0, where digital tinkerers gather to talk about online data from the New York Times and the latest trends in information technology. Next Thursday is Mobile/Geolocation night (which is free). Presenters will include Mano Marks from Google, John Britton from Twilio, Matt Kelly from Facebook and me. I'll be talking about The Takeaway's Sourcing Through Texting project. There are certainly opportunities here to mash up APIs and build on some nifty platforms. I'll talk about that, too. But as we continue working toward connecting with sources via texting, some of our best insights have come from coffee shop conversations, church bulletin announcements and short-codes scrawled on sidewalks. What's so exceptional about the journalism innovation award The Takeaway won yesterday is that it's not for a broadcast, a series or a blog post. "Sourcing Through Texting" has been a process of immersion, exploration and rapid prototyping. Journalists and community leaders spend time in a neighborhood focusing on a simple question: How might reporters and citizen-sources make better connections through texting? The answers are still emerging. We're still making prototypes. Yet, yesterday the concept won a Knight-Batten Special Distinction Award for innovation in journalism. Since the award application went in, we've gone to Miami to run another experiment in Little Haiti, and Detroit's WDET aired a week-long series that evolved from the project. That the award effectively predates those happenings is a huge jolt of support for experimentation, design thinking in journalism and everyone who contributed to this unique collaboration. That includes folks from The Takeaway, Public Radio International, WNYC Radio, WDET Detroit, WLRN Miami, The Miami Herald, American Public Media's Public Insight Network, Mobile Commons, the Institute of Design at Stanford and the residents of Southwest Detroit and Miami's Little Haiti. 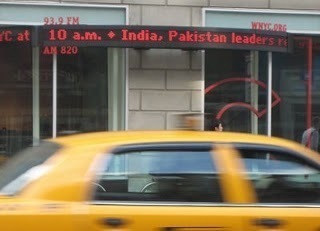 Sourcing Through Texting is a project of The Takeaway, which is produced by WNYC Radio and Public Radio International. It was made possible by a grant from the John S. and James L. Knight Foundation. Disclosure and disclaimer: I helped develop and produce this project. As always, the words here are my own and not those of my employer or any of the entities mentioned. Tuesday night I'll have the fantastic privilege of making a quick presentation at the NY Tech Meetup about our news-technology efforts at WNYC. I'll also invite folks to connect with us in the interest of, well, the public good. Huge thanks to Nate Westheimer for his interest in our work and the opportunity to say a few words. Acknowledgment where due: WNYC's public radio news-tech projects, including the Super Simple Mapping tool, are supported by the John S. and James L. Knight Foundation and the Corporation for Public Broadcasting. Making collaborative maps is easier than ever. But maybe not quite easy enough. One of the projects I'm working on at the moment is a super-duper-simple tool to help public radio and television stations (and pretty much anyone else) collect and map local information from their audience. We're in the design phase right now, and we've mocked it up for feedback. The video is below. Whaddya think? Let us know! The person crafting the overall sound and content of your local public radio station usually is the program director, and I have the honor of speaking at an annual gathering of PD's from across the nation this week. My first talk is about a WNYC community crowdsourcing project called Your Uncommon Economic Indicators, which began just about a year ago when the economy collapsed. It focuses on getting people to contribute insights about the economy from their neighborhoods. It has grown to include some special side projects. One is Halted Development, a look at unfinished or vacant housing in New York City (link to big map is here). Another is a video contest, in which this video took first place. The slides I used in my presentation are available as zipped PowerPoint and Keynote files (both about 30MB) and as a pdf (3.5MB). The second presentation is with Tom Detzel of ProPublica about the great partnership WNYC has had with ProPublica, including how it came to be and how we've make some great journalism together. Part of my discussion is stolen from my earlier blog post using dating as a guide to successful collaborations. The handout I'm giving to people in the room is here as a pdf. I'll update this post if/when audio or video of the talks are made available. I've joined an exclusive club of New York City microbloggers. Twitter? Ha. Facebook? Kidstuff. We're talking bricks and mortar, baby. My missives scroll across the facade of WNYC's building in west SoHo, zipping into your field of view as a parade of little red lights. It's the WNYC News Zipper. As you walk to work or sit in traffic on Varick Street, I've got your eyeballs. And I know where you are, no fancy GPS required. Even if it's partly cloudy in the Bronx, I am absolutely certain you're in a downpour. User customization? Easy. I can sense you're in line for the Holland Tunnel on your evening commute home. So how about a little news about your governor and his chief rival? It's tempting to simply repurpose our tweets or web headlines, feeding them automatically to the sign. But it's also clear that wouldn't be as special. Or impactful. Or memorable. So I've been recrafting our material specifically for my particular version of a hyperlocal, mobile user. I've been doing this for a few weeks as a prototype, and soon WNYC's editors, producers and hosts will feed lines to the sign. What I've learned by writing -- and watching -- those little red words will help our staff craft the phrases that catch your eye as you zip by. 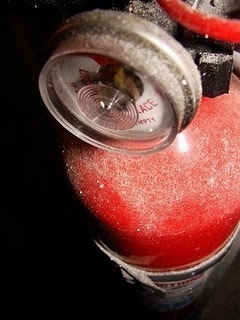 Consider, for a moment, the location of your nearest fire extinguisher. And just how well did you use it last time? Right. Chances are you're not prepared to skillfully put out a fire where you are sitting. At least you're not practiced. But what if you had a non-emergency reason to use a fire extinguisher every once in a while? Maybe to clean your desk. Or a spill. (Nearest paper towel, anyone?) Using it occasionally would help insure that in case of a fire, you would both a) actually use it and b) use it well. The best example of this is the daily production of our national morning program, The Takeaway with John Hockenberry and Adaora Udoji. The show's staff may just be the best breaking-news response team in public radio -- because they make the show in real-time every day, incorporating fresh news as they go. When the news happens to be really big, they're not just prepared ... they're already there. In case of a civil emergency in New York, we'd want to quickly map shelters, closed roads, danger zones, escape routes. Even locate our staff. But we weren't prepared to whip together those kinds of maps in mere minutes. Now we're honing those skills by incorporating such work into everyday projects. When news hits the fan, information flies everywhere. Consolidating that data is key ... and also happens to be handy in everyday work. In the course of discussing a Mumbai-like terror attack in NYC, we discovered that our news-editing software can also check a listener email box. That's one less window to watch. We designed our newsroom so that in a crisis nobody needs to change seats, which would move them away from familiar surroundings. As a byproduct, when something doesn't flow quite right during daily work, I try to make sure we address it now so we don't get caught off guard later. In planning for election night, and now for the inauguration, we developed tools and techniques that will serve us again in a major unexpected event. We now know how to quickly rip up our station's home page to focus on a single topic. And in order to provide real-time election-night returns, we found new ways to clear the information path between the editors and the home page. We share a statehouse reporter with stations across our region. So when former governor Eliot Spitzer imploded in a prostitution scandal, we didn't have to think twice about how to move information and audio between stations. We just used the FTP site and email list we use every day. I've long been a fan of drills, and there are many more of those in our future. But by incorporating a little drill into our regular routine, we're better prepared for situations that are anything but.